When the Insert Slides window appears, select the Basic Layouts tab on the left, then choose a slide layout. 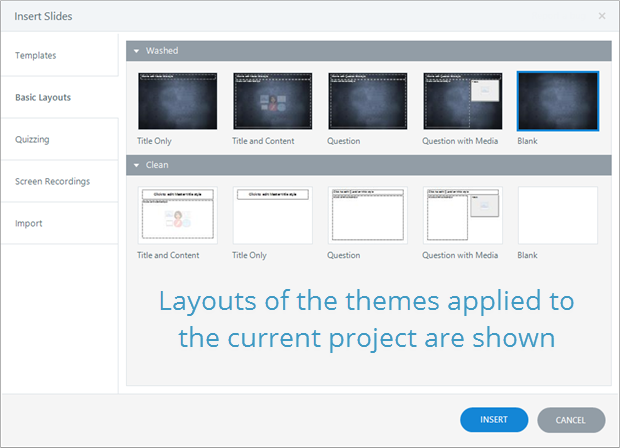 Tip: Articulate Storyline displays the layouts associated with each theme in your project. Go to the Design tab on the ribbon, right-click a ready-made design theme thumbnail, and choose one of the options to apply it to your project. Thereafter, all the layouts associated with that theme will be available on the Basic Layouts window. Create a custom theme in the current project. All layouts you create as part of the new theme will be available on the Basic Layouts window.